Mix, heat, cook in a skillet until golden brown. 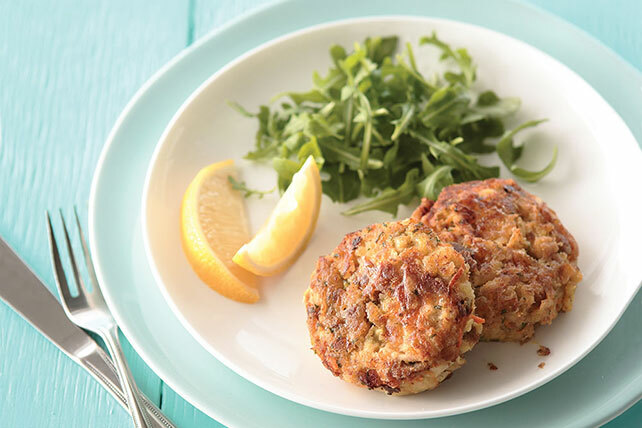 These crispy tuna cakes are such a snap to make. Could it be you've found a new family favorite? Combine ingredients. Refrigerate 10 min. Heat large heavy nonstick skillet on medium heat. Use ice cream scoop to add 1/3-cup portions of tuna mixture, in batches, to skillet. Flatten into patties with back of spatula. Cook 6 min. or until golden brown on both sides, carefully turning after 3 min. Repeat with remaining tuna mixture. Substitute 1 cup KRAFT Shredded Low-Moisture Part-Skim Mozzarella Cheese, 4 chopped green onions and 1 Tbsp. lemon juice for the cheddar, carrots and relish. Shape tuna mixture into patties as directed; place in single layer on baking sheet. Refrigerate 1 hour, then cook as directed. Substitute MIRACLE WHIP Light Dressing for the mayo. Serve with KRAFT Cocktail Sauce or KRAFT Tartar Sauce Hot & Spicy.